Celebrities Sunglasses: 2013 Grammys Chosen Eye Candy [Photos] - CTS Wholesale LLC. The biggest Red Carpet event of the year, the 55th annual Grammy Awards took place February 10th, and all the stars were out, eyewear optional. The music industries top movers & shakers sparkled amid camera flashes and cheers, with a nod to fashion's biggest names. Check out the most popular celebrities sunglasses below. From Eveningwear to Eyewear, there's no question people tune in not only to see who wins, but also to see what the stars are wearing. Eye candy is second only to shoes when it comes to accessorizing any red carpet ensemble. For the male persuasion, celebrities' sunglasses are as vital as their female counterpart's clutches i.e., evening bags. 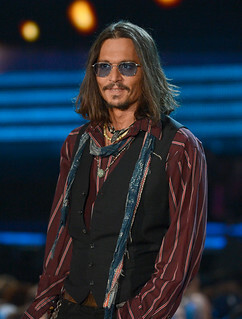 Johnny Depp, appearing as a presenter for this year's Grammys Award ceremony is seen in a pair of stylish, blue tinted square aviators, while Sean Paul and Pitbull opt for the more classic teardrop shaped aviator sunglasses. Maroon 5 front man, Adam Levine meanwhile is seen looking as appealing as ever in black wayfarers. Wiz Kalifha, featured on Maroon 5's single Payphone also chose a gold trimmed pair of wayfarer sunglasses. For the ladies, one might say that designer Roberto Cavalli dominated the red carpet choices. From Miranda Lambert, Carri Underwood and several other vocalists chose stunning gowns by Cavalli. Also seen looking stunning was Katy Perry in Gucci, while Taylor Swift glowed in a J. Mendel gown of silver and ivory. If Cavalli in fact ruled the red carpet for evening gowns, it is undoubtedly safe to say that the all time favorites Aviators and Wayfarers dominated as the chosen eye candy of celebrity sunglasses. While one might guess that Ray Ban was the brand of choice, it will be much easier to find a comparable pair of sunglasses than it will be to find a gown comparable to the likes of Cavalli. Shown below are just a few of the terrific aviators & California Classics available now at CTS.